Happy Monday! That's not an oxymoron is it? Well, to help get us through the roughest day of the week, we're bringing you another edition of Take My Money Monday, where we ogle at all the lovely items we've been eyeing, and tell retailers to just go ahead and take our money already! 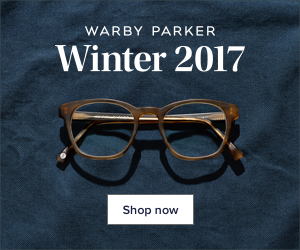 Without further ado, take a look at the pieces we can't wait to get our hands on (and that may or may not show up in our closets soon). With the surge of warm weather we've had in the midwest, I'm just itching for Spring. Right now, I'm all about dreamy pastels with pops of black (I mean it is still technically winter). Florals, stripes, and ruffles are clearly a big theme for me. 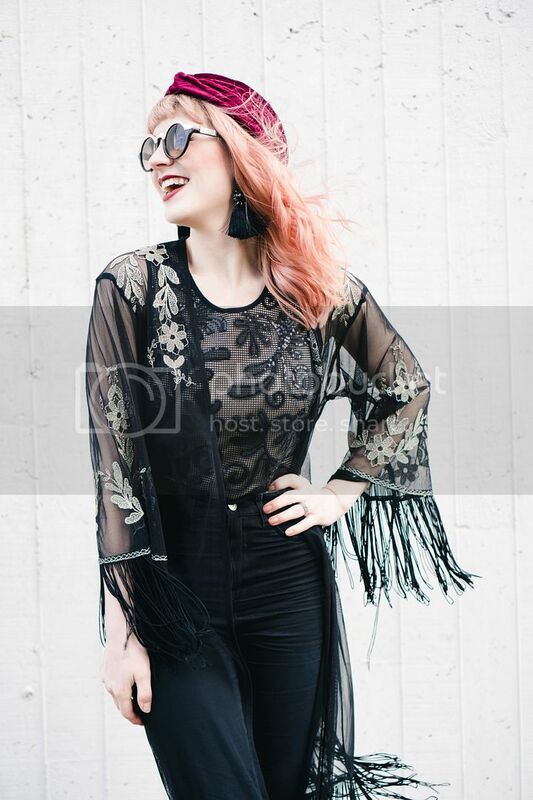 From texture to sleeve insanity level, give me all the feminine statement pieces this Spring! I am so ready for warm weather and all of the sandals, dresses and bright colors that come with it! I am really loving bright pops of pinks, blues, greens, purples and yellows this season. 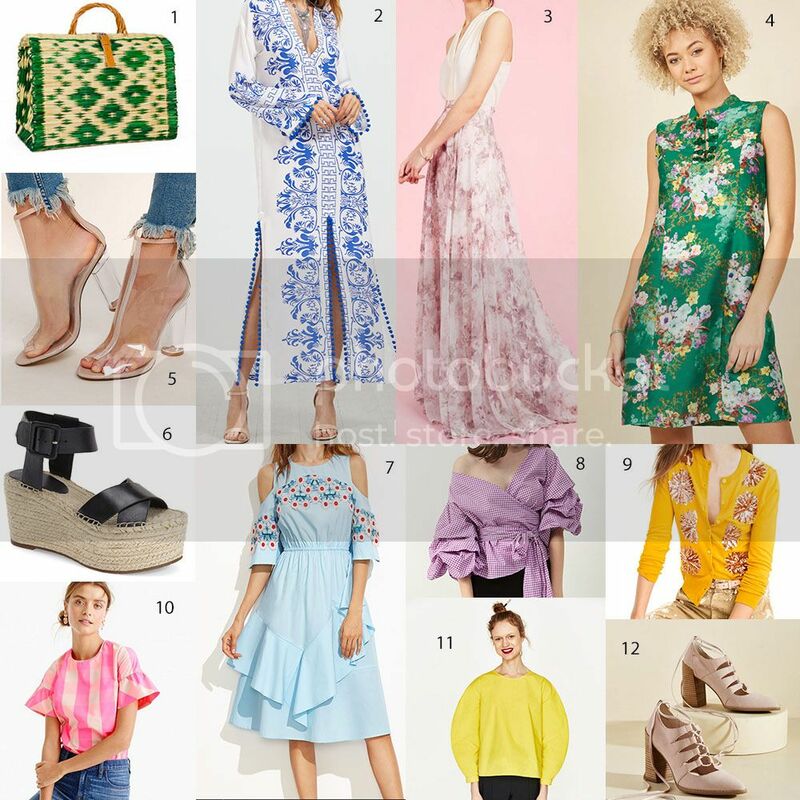 I'm also very excited to try out some of the trends for spring, especially lucite heels, huge ruffles, statement sleeves and flatform sandals. What's on your spring wishlist? Let us know below! Turbans have been gaining popularity over the past few years and they are the perfect way to mix a touch of retro into an outfit. We took inspiration from very different places to show how versatile turbans can be, from a structured more formal look to a flowy, laid back casual look. 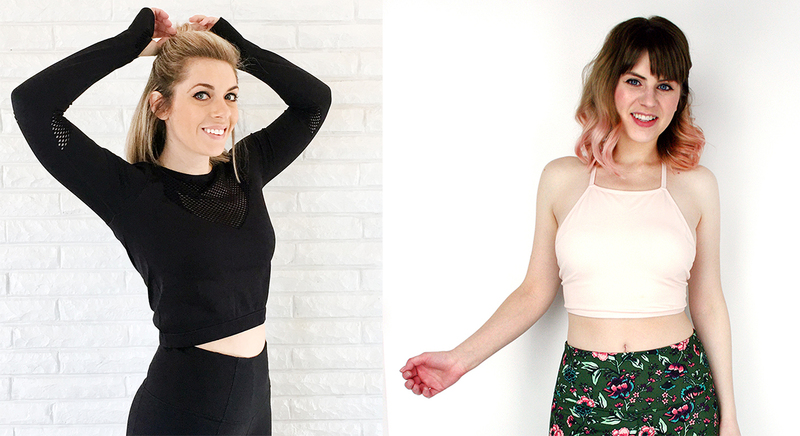 Get all the details on how we styled them below! On a holiday trip to St. Charles, my mom, aunt and I all decided to get matching turbans to commemorate the trip. 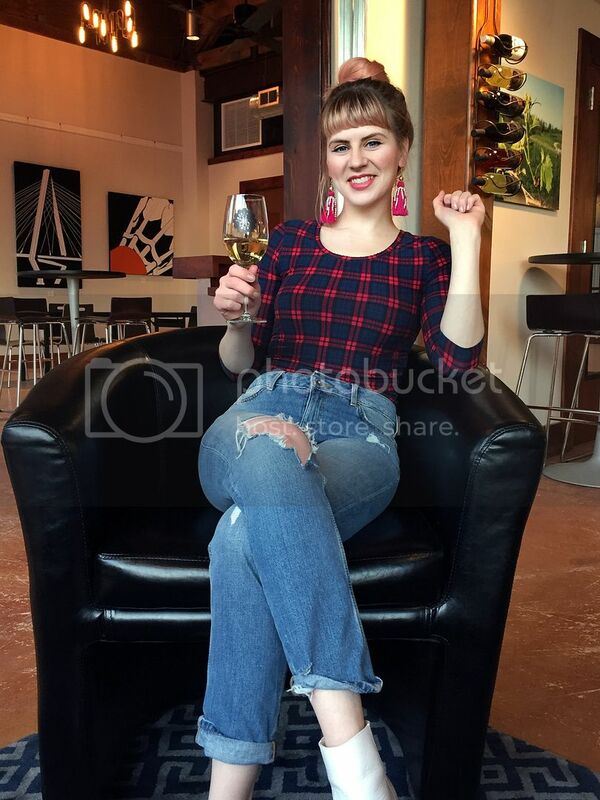 We saw these burgundy beauties at a boutique and snatched them up. 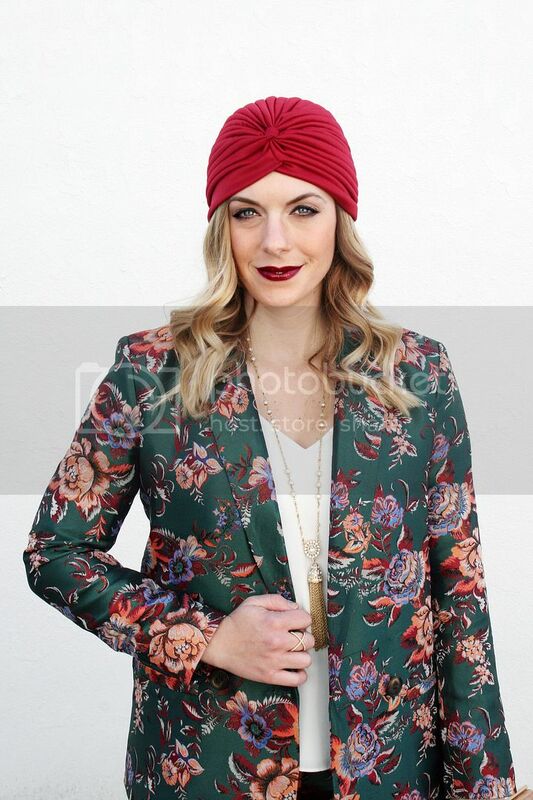 The great thing about turbans is that they really go well with just about any outfit. 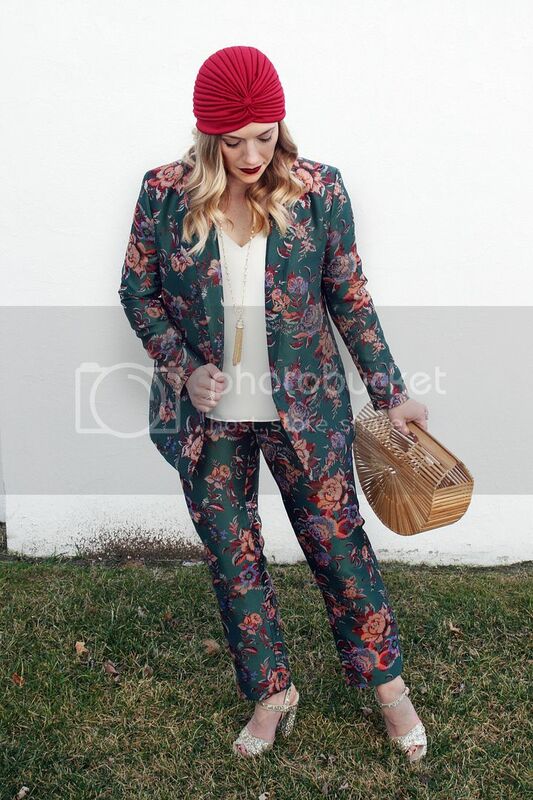 I decided to really go all out for this look and paired mine with a floral pant suit, glitter heels and a vintage inspired bamboo bag, because why the heck not? It's fashion, let's have fun with it! I'm really glad that I decided to go all out, because I think this might be one of my all time favorite outfits. 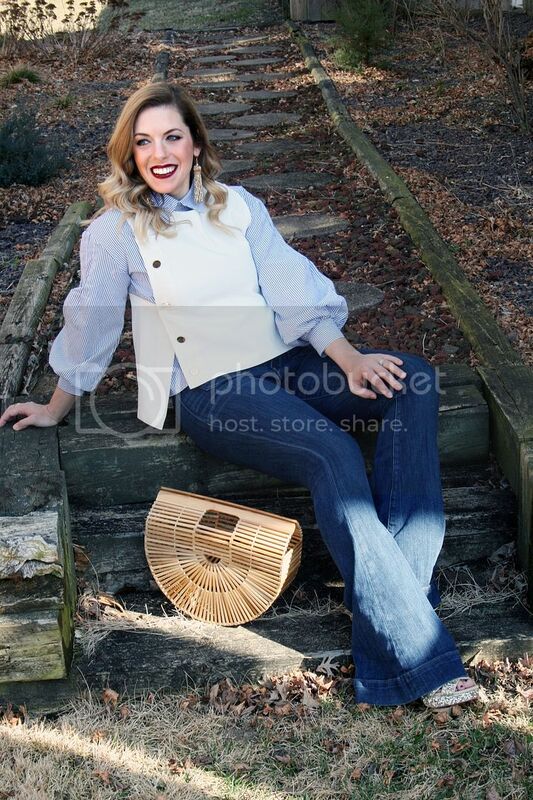 It's the perfect mixture of vintage glam and pulled-together chic. 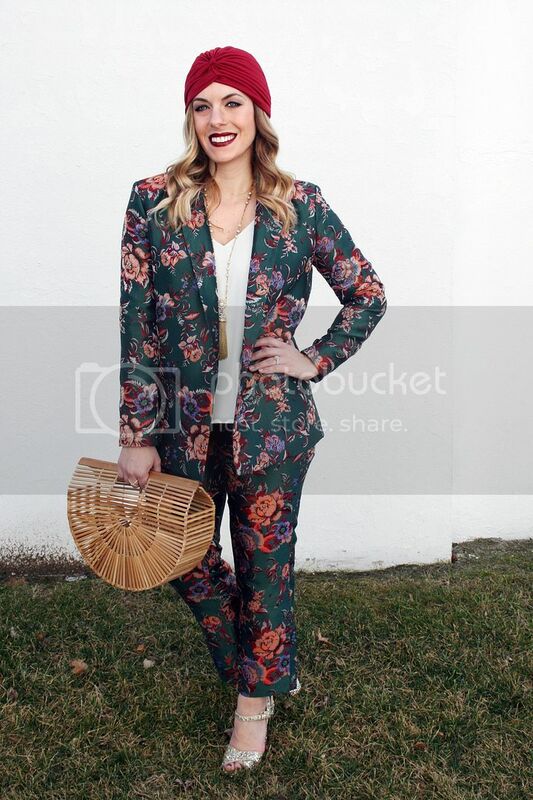 You know already that we love a good dark floral around these parts, so obviously I chose to dress in a whole suit covered in it. I recently got these gold glitter heels from Topshop too, because really, you can never have too many sparkly things in your closet! 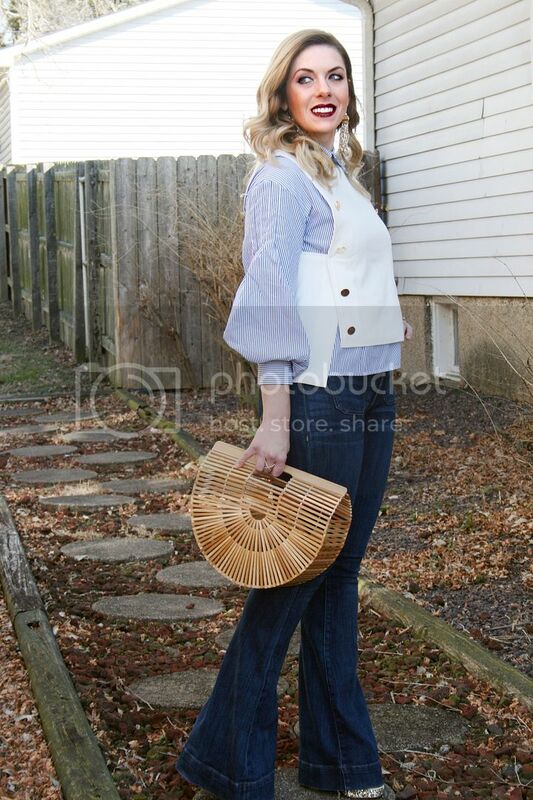 I've talked over and over again about how much I adore this vintage style bamboo bag as well. 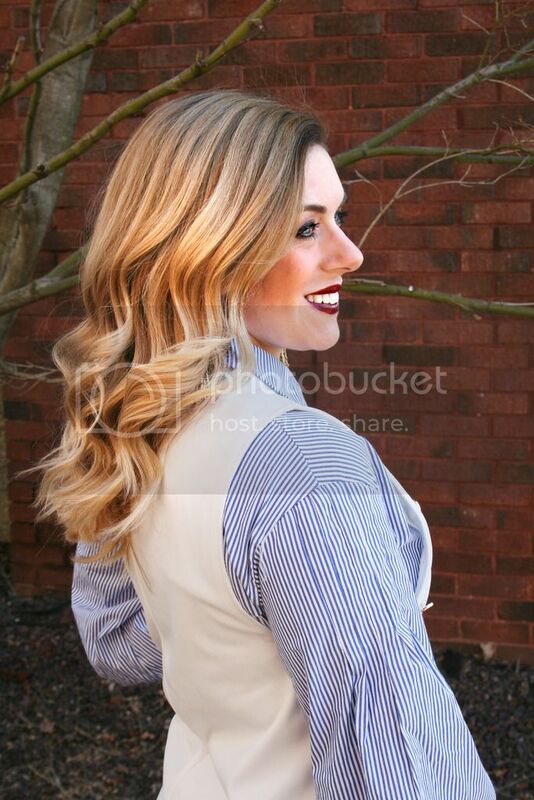 It's so versatile and it's absolutely perfect for spring and summer. 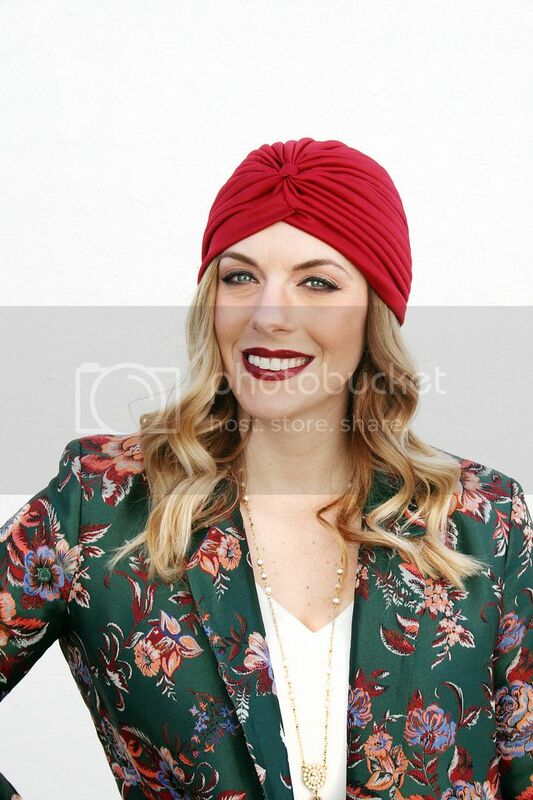 I tied it all together with a dark wine lip to match my turban because, duh. I kept my jewelry minimal with a single long necklace and a dainty ring since the rest of the outfit kind of speaks (screams?) for itself. 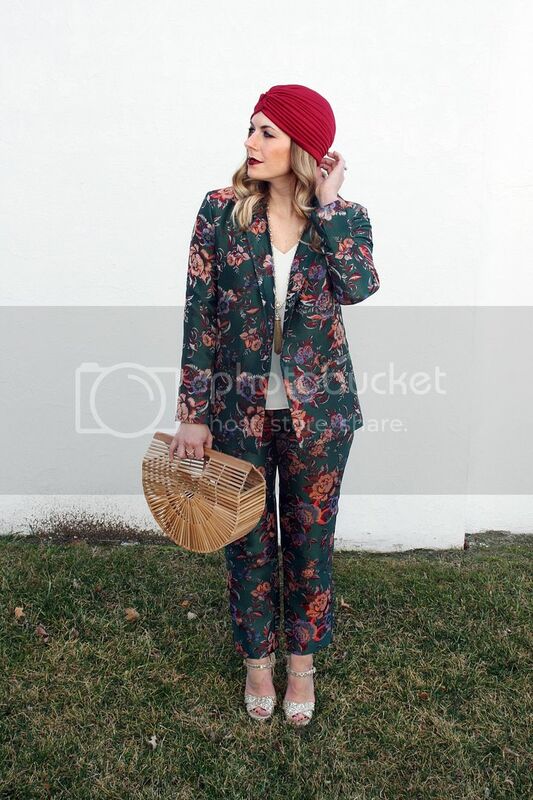 I'm really digging this turban trend and am itching to experiment with more outfits including it! It's a great way to add a little extra something special to any look! 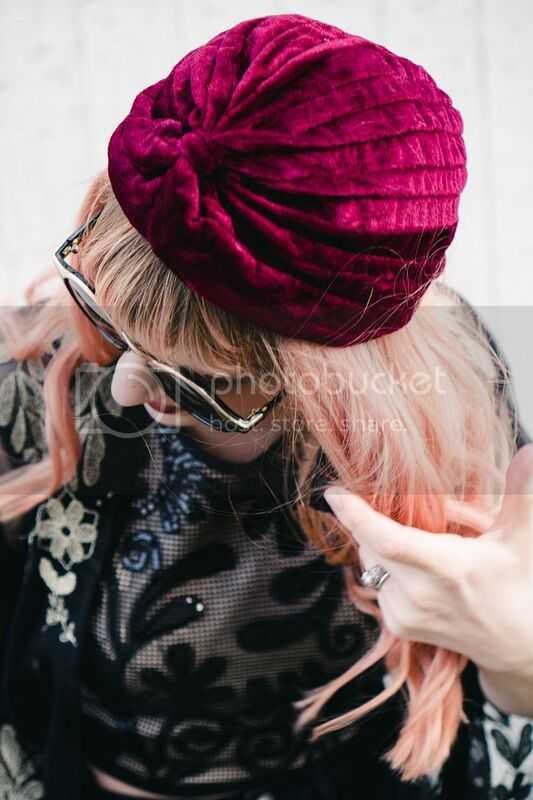 How crazy is it that Jodi and I both bought burgundy turbans on our own and didn't realize we both had them until she saw my Lady in Leopard post? Great circus minds think alike, I suppose. It's so fun to me to see that for as different as our styles are from each other, there's really a lot of overlap! 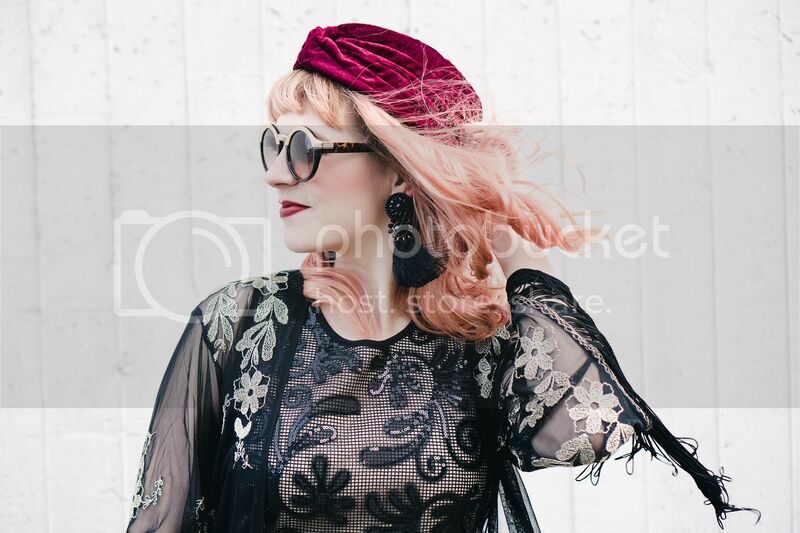 Though turbans were big in the '60s, they were also trendy in the 1920s, so I decided to take some inspiration from flapper style to show off my turban. 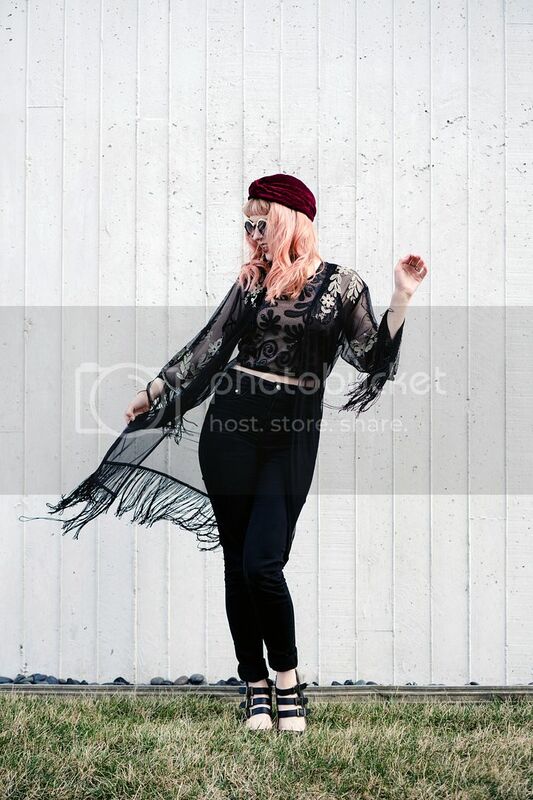 A sheer fringe kimono was obviously in order for a sultry speakeasy feel. 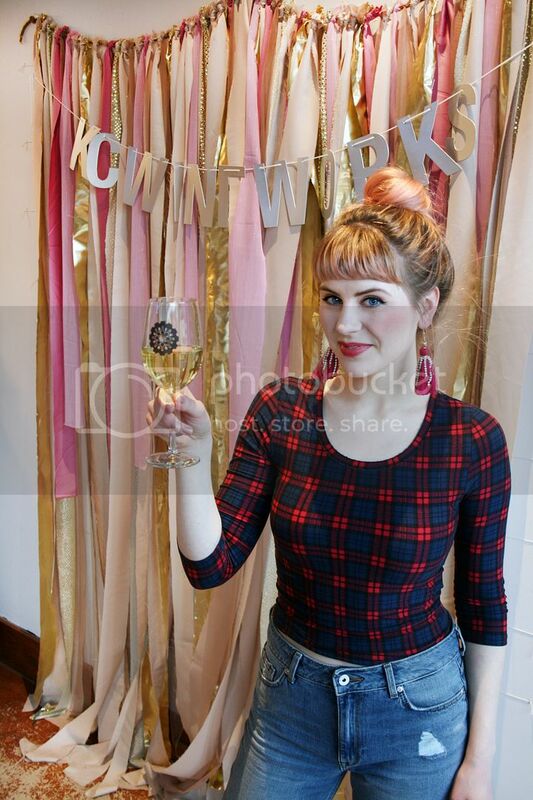 I also styled a sequin crop top to kick up that vibe even more. 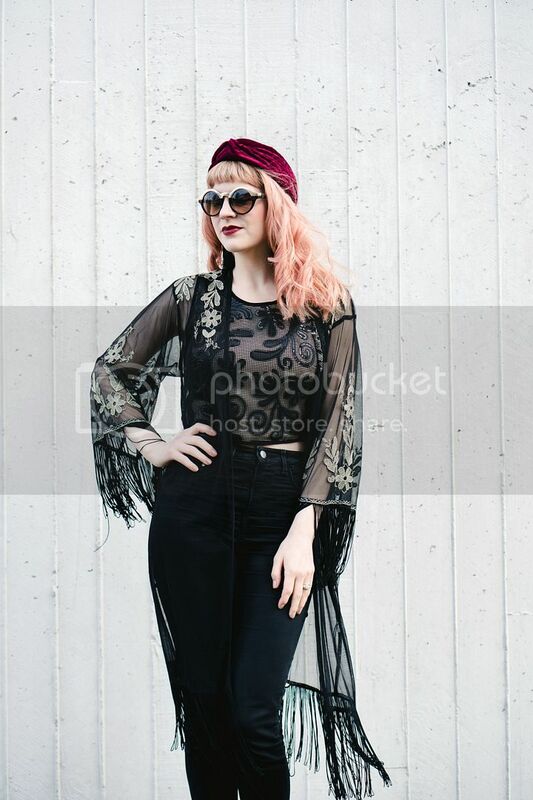 The prohibition era was all about swingy, flowy, nearly boho ensembles. Big, chunky tassel earrings are a perfect accompaniment for a look that's not too structured. Big round sunglasses look like they could have come straight out of a vintage store. 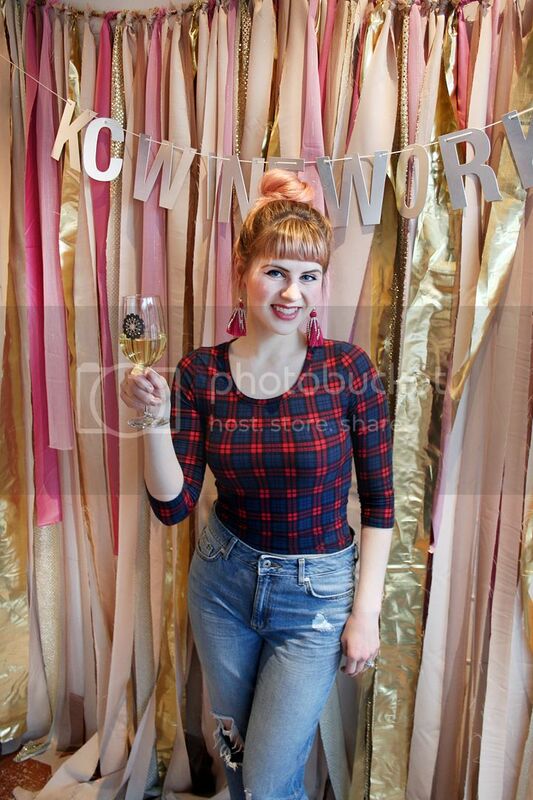 I wore high-waisted black jeans to make the look more modern and wearable for a daytime or evening look. Chunky, buckled shoes are equal parts edgy and 1920s schoolgirl-looking. They're comfortable to wear all day long, but they also make for a fun nighttime statement as well. How about you, would you sport a turban? Let us know what you'd wear it with! 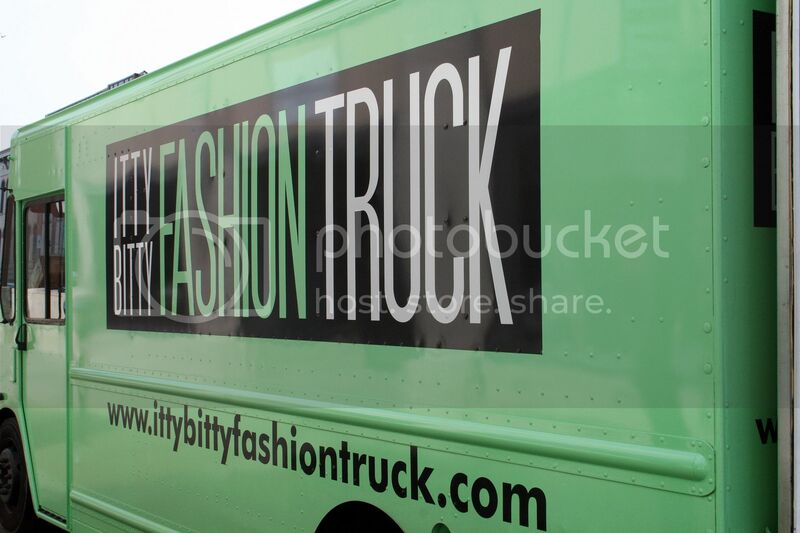 Since we started blogging almost two years ago, I've noticed that I'm much more of a fashion risk taker these days. Thinking of content really gets those creative juices flowing and I find that I'm drawn to certain pieces that I wouldn't have had the guts to wear before. Case in point: this two piece shirt set from Goodnight Macaroon. 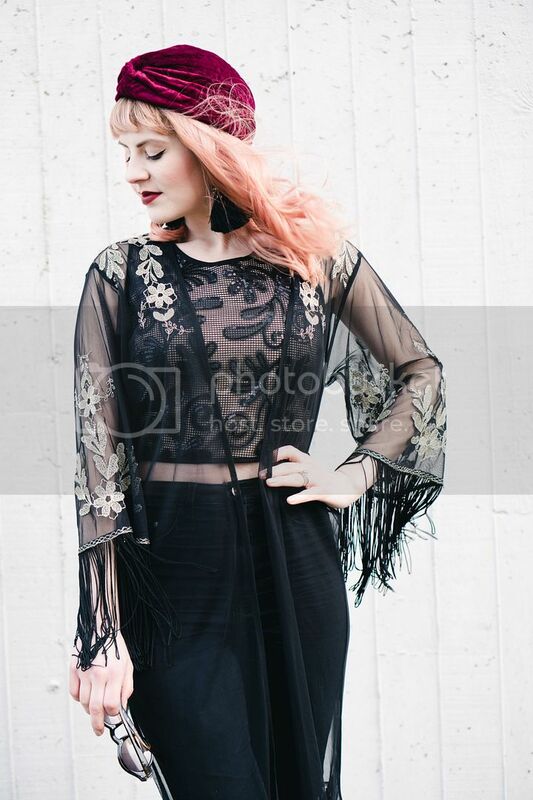 Statement sleeves are most definitely still in going into spring, which is music to our ears! We love a good sleeve around these parts. This top rocks beautiful, full sleeves, balanced out with a cream pinafore-type vest that really adds that little something extra. This top is boxy and full, so I balanced it with sky high flares to elongate the leg. 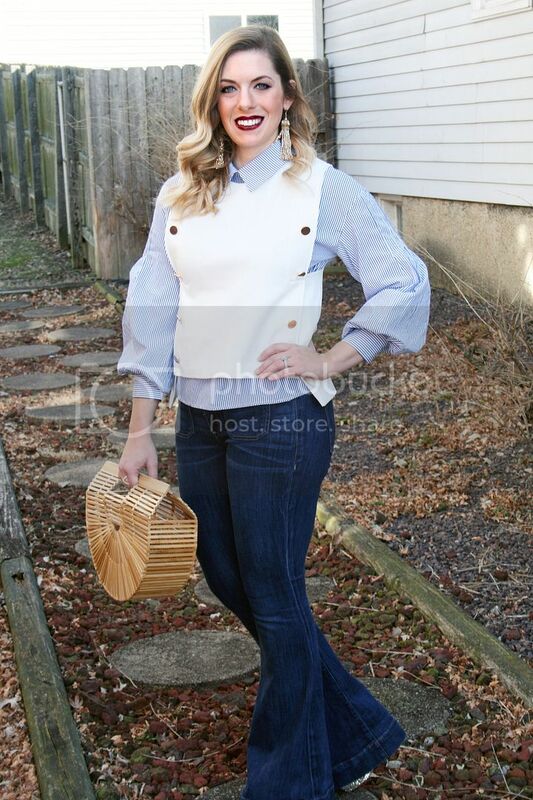 I also added a little shine with gold tassel earrings and finished off the look with my very favorite basket clutch. 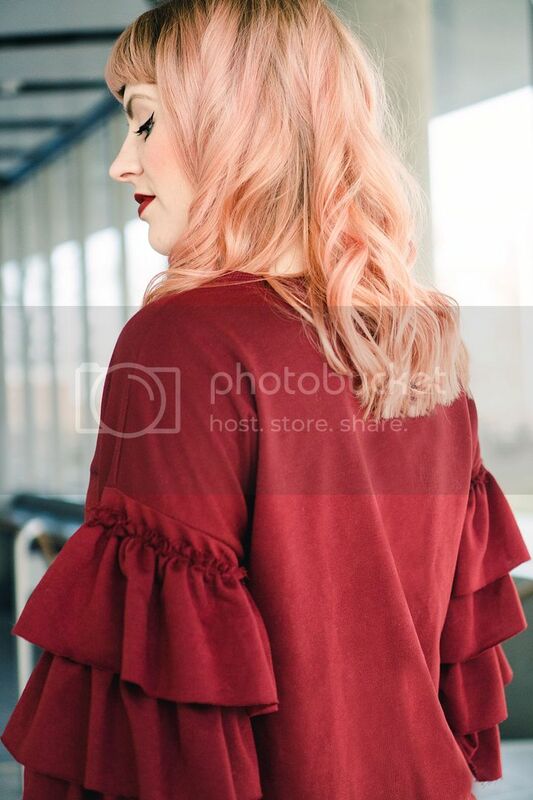 I'm super excited to transition this top into spring and to add more big, beautiful sleeves to my wardrobe! How are you rocking the statement sleeve trend? 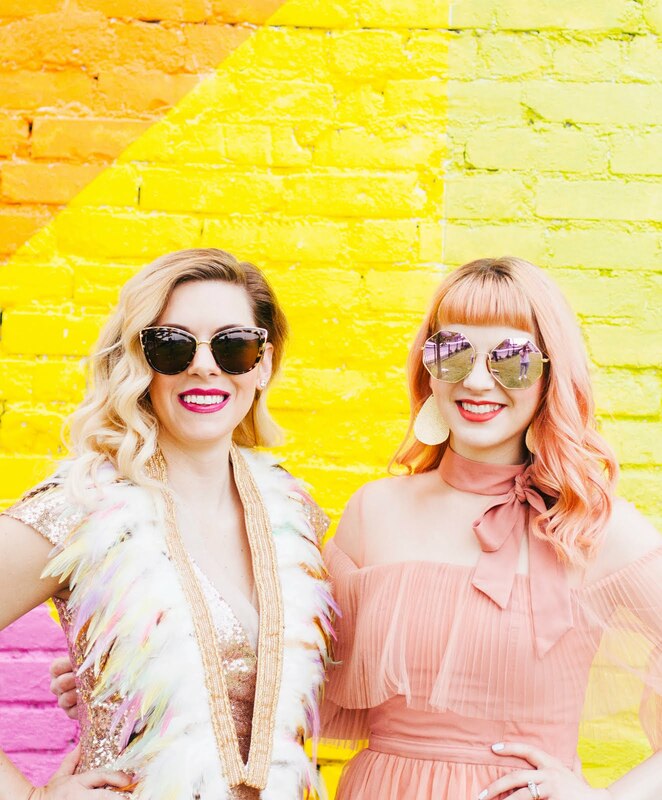 We've been loving statement sleeves since we put together our Favorite Fall Trends list last fall, but they are back and bigger than ever this Spring. If there's only one trend you want to jump on, large-and-in-charge sleeves is it. You can quote us on that. OK, or ruffles. 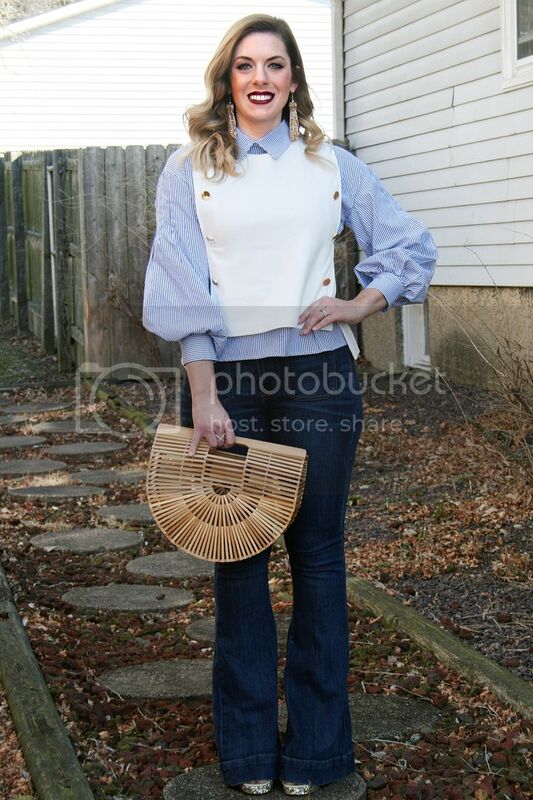 Might as well make it ruffled sleeves to be safe! 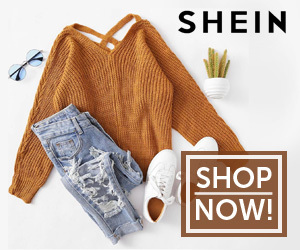 I'm loving this comfy t-shirt dress from SheIn that's super simple aside from the ruffled cha-cha sleeves. 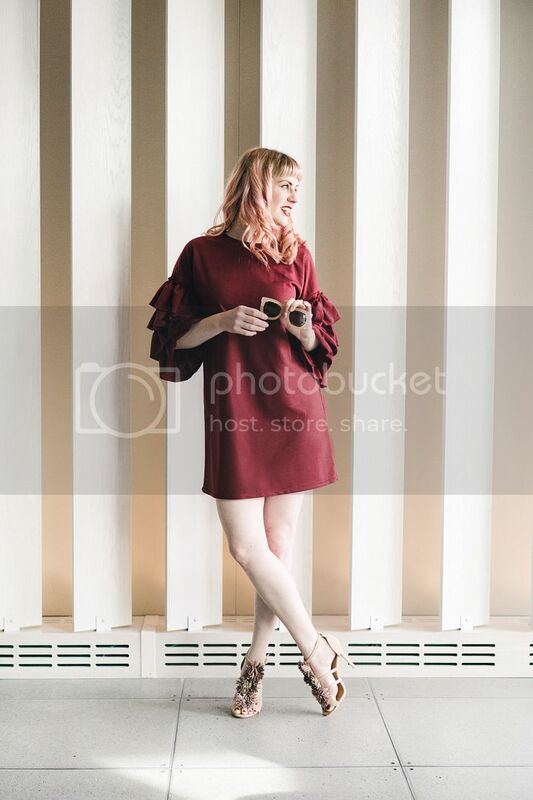 Given how it's basically a basic (I mean, basically), it would be a perfect daytime dress with slides or sneakers, or it could be totally dressed up for a date night. I decided to style it a bit dressier mostly because I've just been itching to bust out these pom-pom beauties. I mean, how fun are these kicks?! The three shades of blush pink make them dang near a neutral, so you can bet I'll be styling them with all sorts of colors and patterns in this warmer weather. 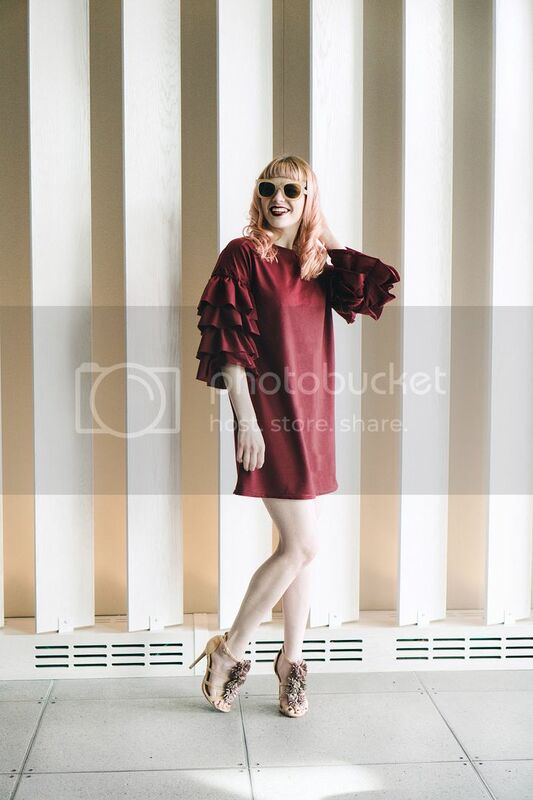 Since both the dress and shoes were already kind of statement pieces, I opted for no accessories other than coordinating retro-inspired sunglasses. Because a girl's gotta have her sunnies! A matching maroon lip color and retro cateye finished off the look with a perfectly retro twist, as per usual. As a bonus, my new-ish rose gold locks rounded out the monochromatic color palette nicely. 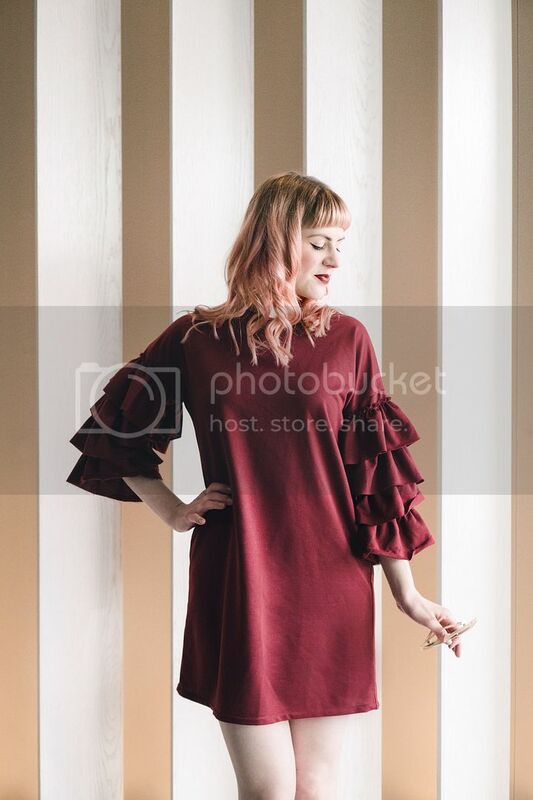 What do you think of the ruffle trend? Would you rock sleeves bigger around than your head? Let us know if the comments! 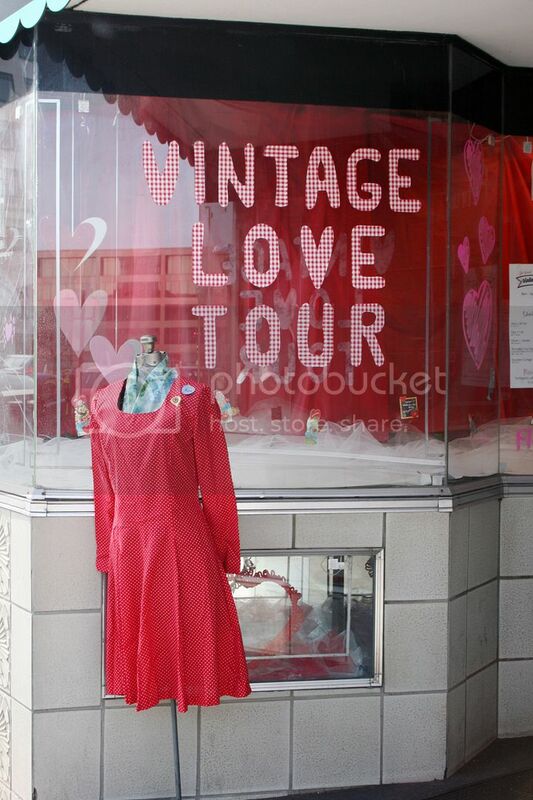 Last weekend, I took my mom on a day date and we headed to Springfield to check out the Vintage Love Tour hosted by Springfield Vintage and other vintage shops in town. I hadn't been to a lot of the shops listed on the tour, so I was excited to check them all out. 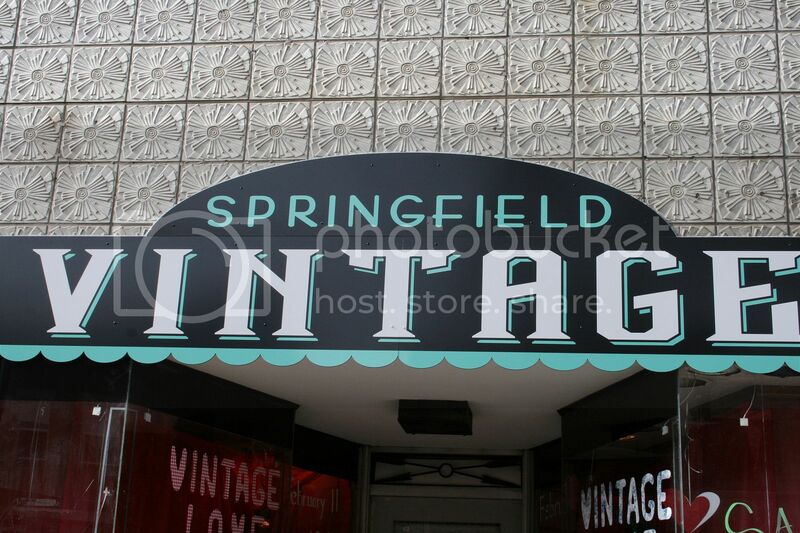 Our first stop was Springfield Vintage. 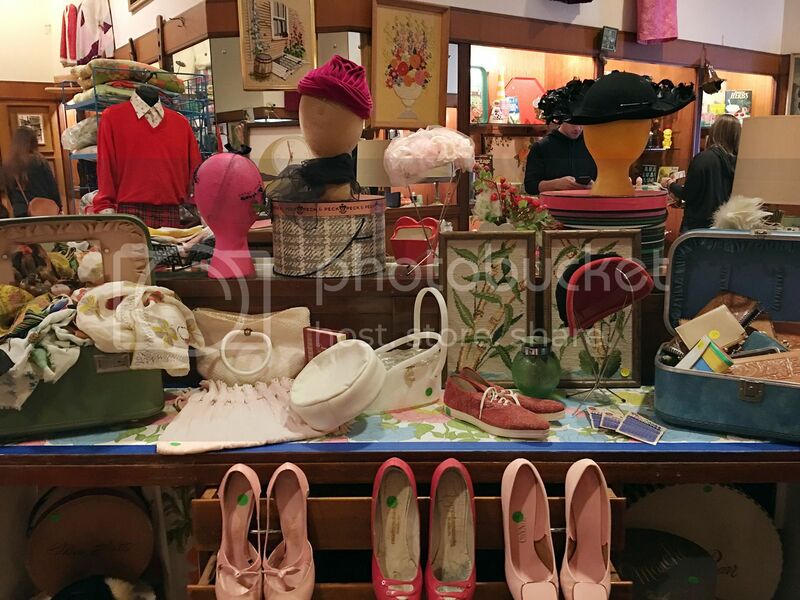 It's a great shop full of all manner of vintage goodies. 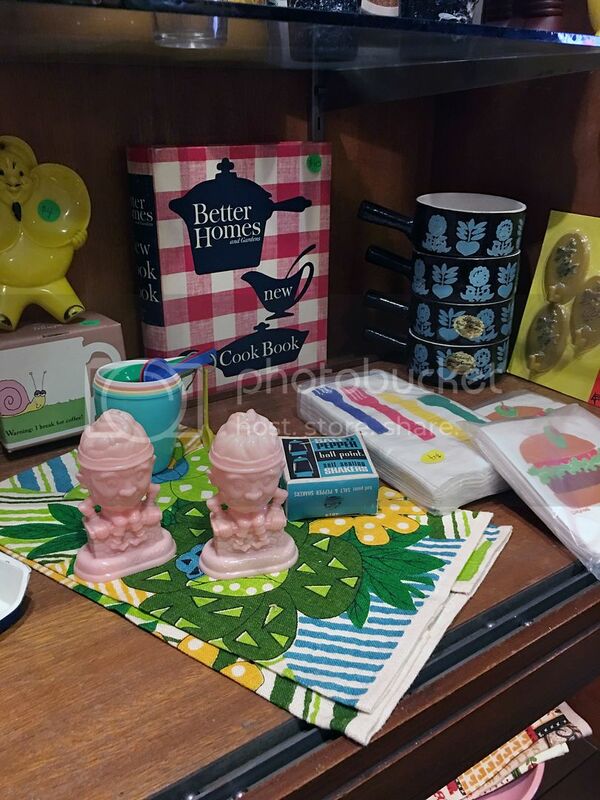 They've got everything from furniture to clothing, and all the knick knacks in between. 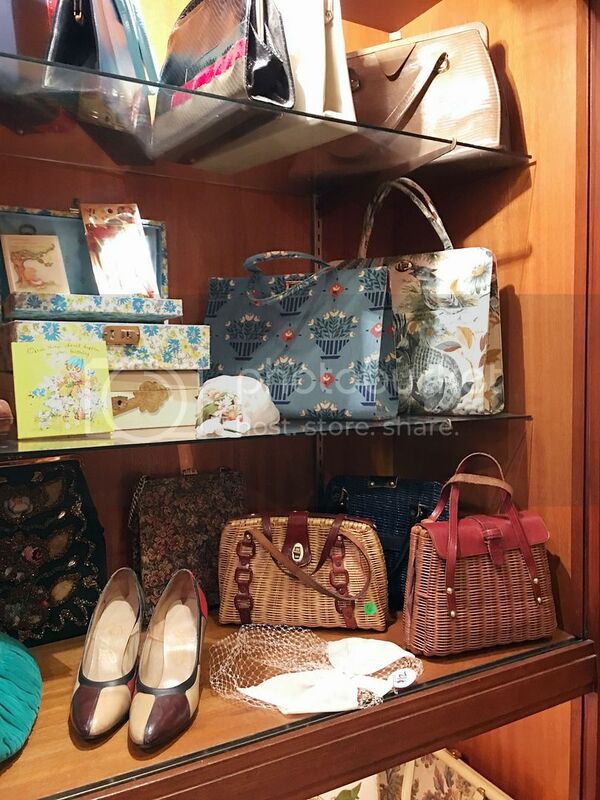 I love a good vintage purse and they did not disappoint with their collection! They also had several amazing coats, dresses and shoes too. We will definitely be visiting them again! 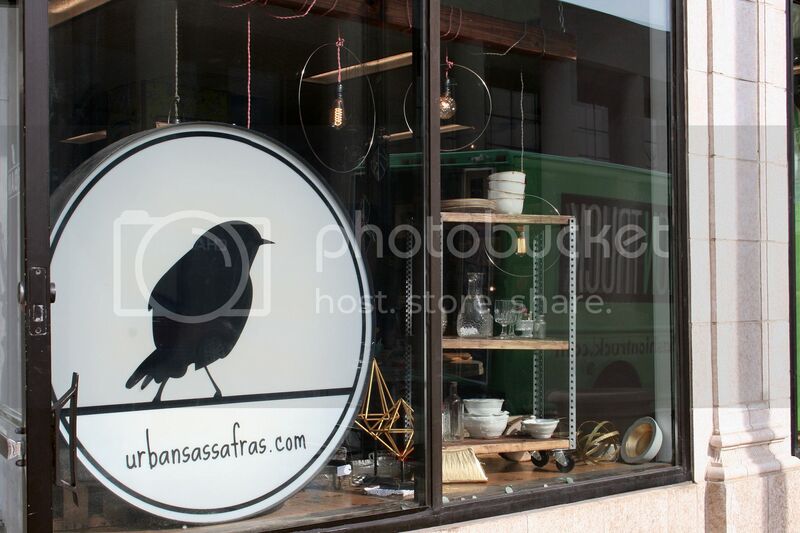 I've driven by Urban Sassafras countless times, but never had the opportunity to go in. I am so glad I finally did because it was much cooler than I expected! 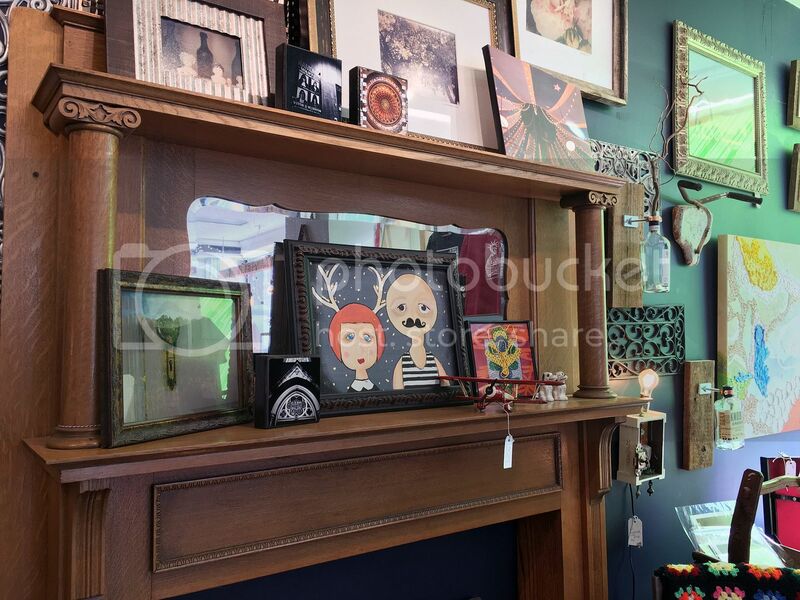 They feature all sorts of local art and handmade items, plus some clothing. 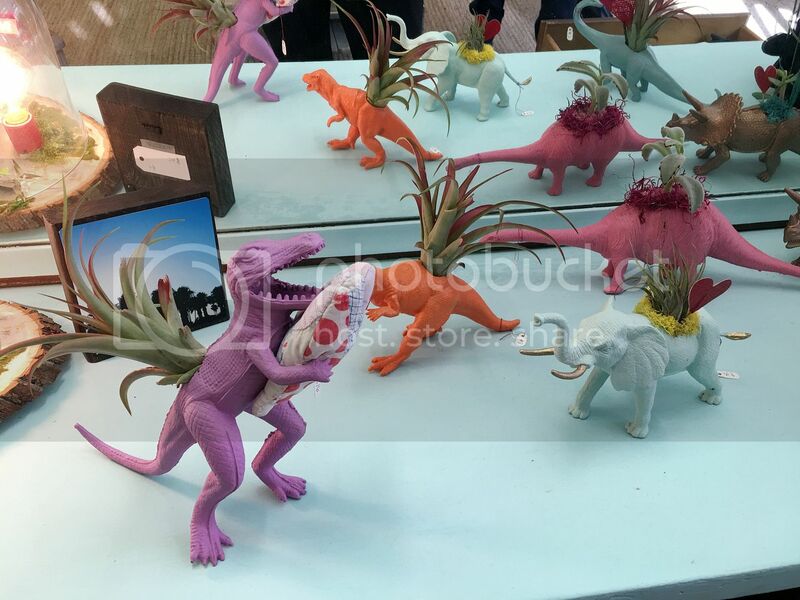 If you follow us on Instagram, you already know I picked up one of the little dinosaurs for my husband for Valentine's Day. It was the perfect gift! I'm going to buy all of my gifts from Urban Sassafras from now on (and gifts for myself too). 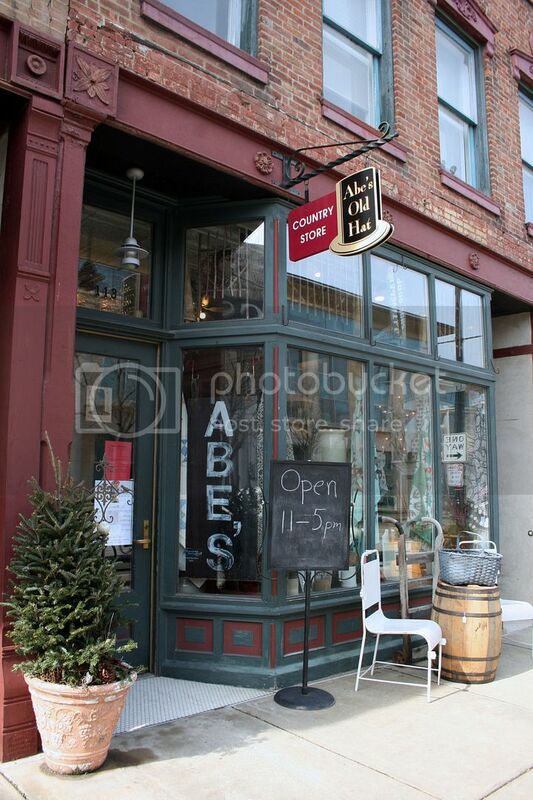 After Urban Sassafras, we stopped at Abe's Old Hat. 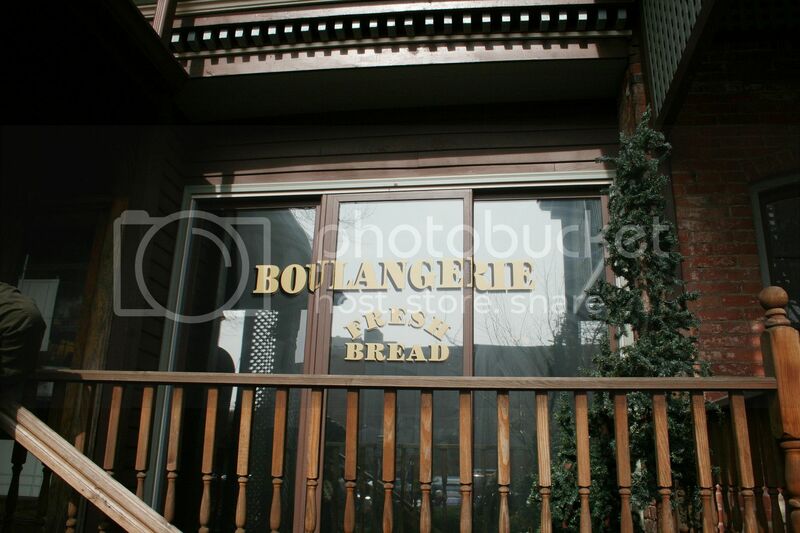 Again, I had no idea this place existed before this tour, but I am so glad I know now! It is full of antiques and really cool historical pieces too. We had a great time just looking at everything and learning a little bit about history to boot. 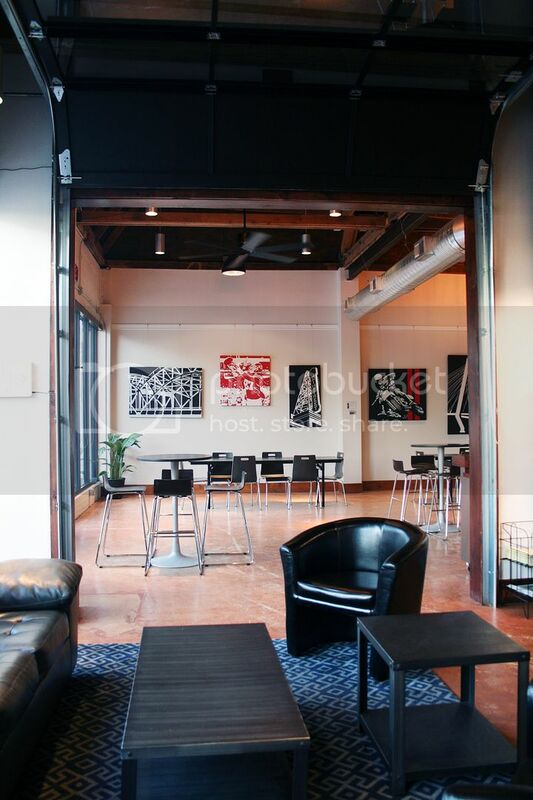 This would be a great place to take visitors from out of town to show them some of the fantastic antiques we have here in Central Illinois. 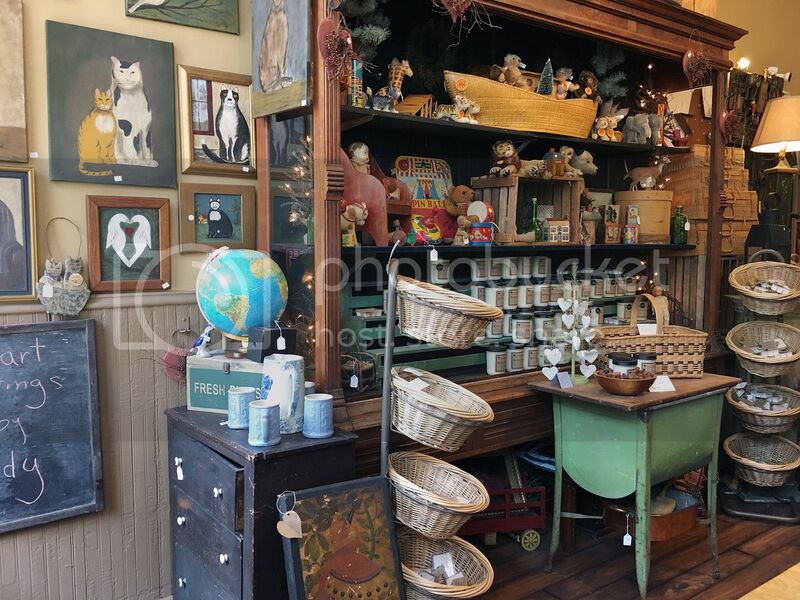 Do you have a favorite antiques or vintage store that you love to shop at? 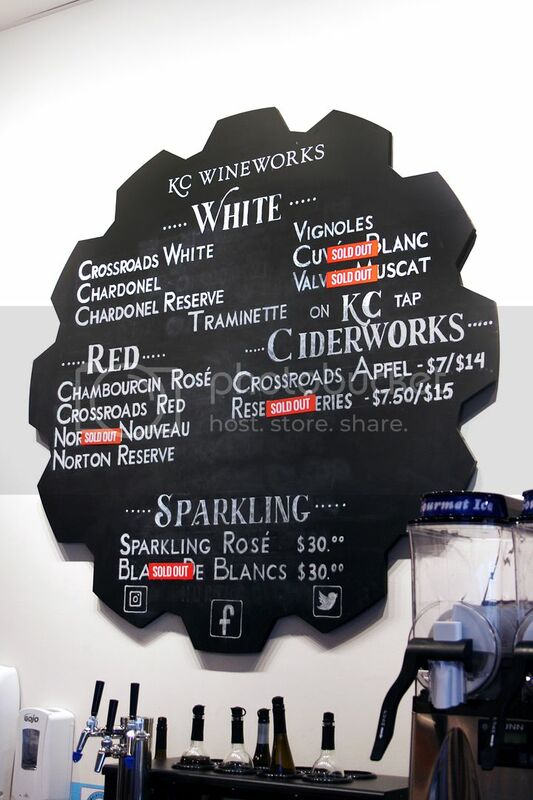 I'm always looking for new ideas and places to try, so let me know in the comments! You have the theme song from Aladdin stuck in your head now, don't you? 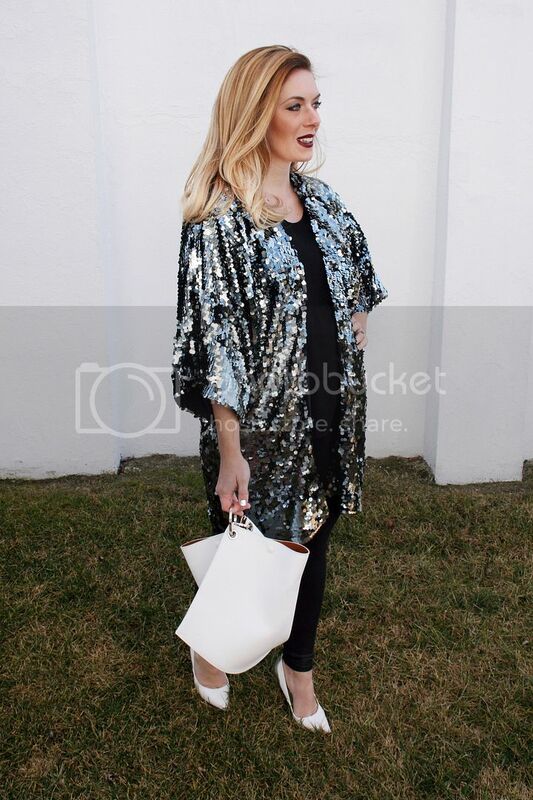 Apologies, but there just isn't any other way to explain this sequin kimono! Now, you all know of our love for kimonos. 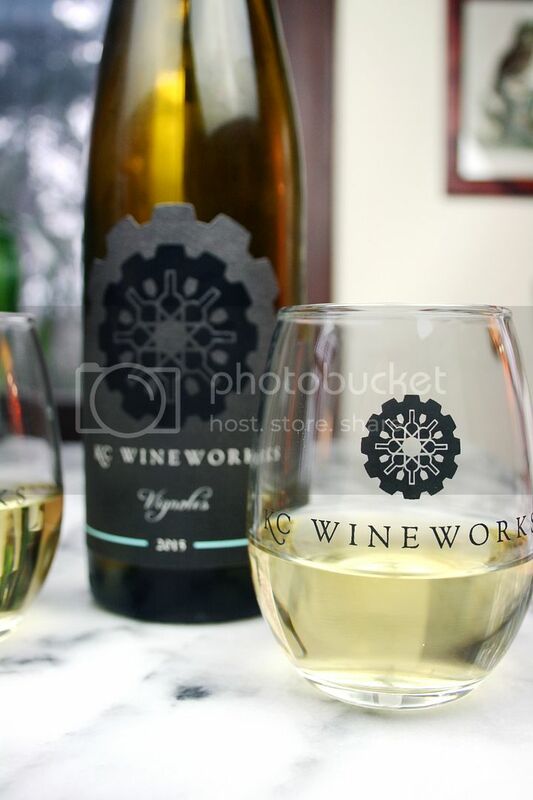 It's been documented countless times, plus we did a handy round up post too! 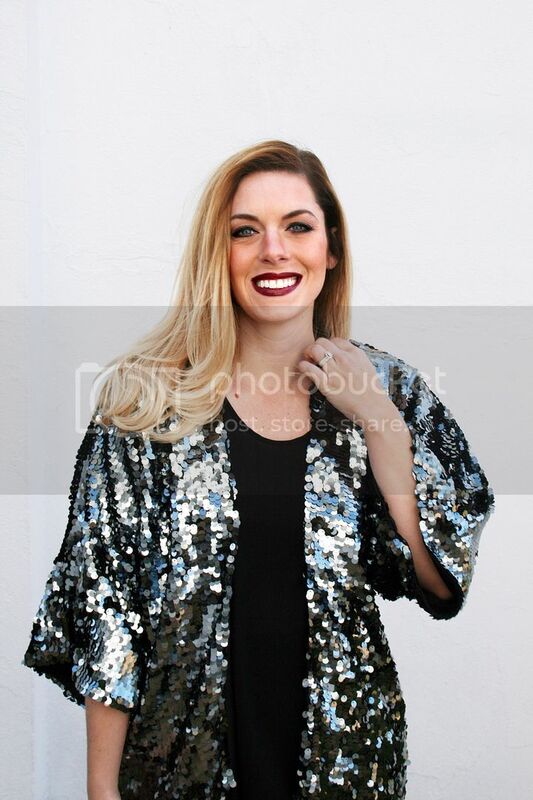 The next logical step for me in my kimono game was to up the ante with sequins. Since a sequin kimono is a huge statement piece in and of itself, I kept the rest of the outfit simple with black and white. Don't let anyone tell you that you can't wear white after Labor Day either. You can wear white whenever in the heck you want to girl! This look would be perfect for a hot date night, a party, a girls night, or really just anytime you need to feel shining, shimmering and splendid. What do you think? Is a sequin kimono right up your alley or do you prefer your sequins via another article of clothing? Let us know in the comments!